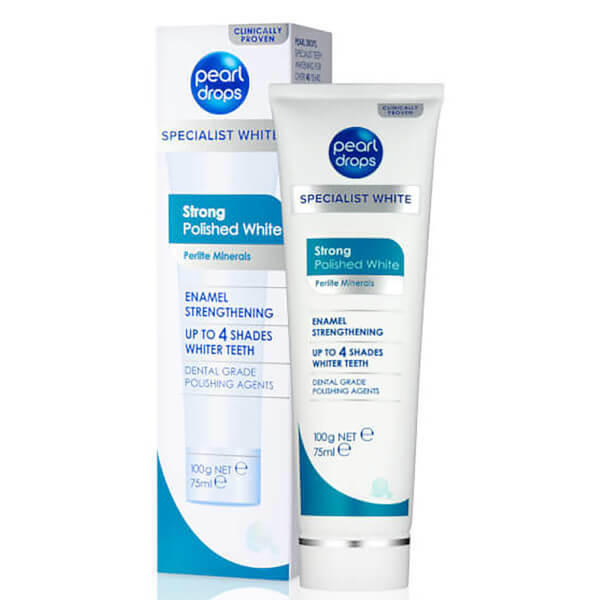 Experience that dentist-clean feeling at home with Pearl Drops Strong Polished White, an advanced yet low abrasion whitening toothpaste. Formulated with Perlite, a dental-grade polishing agent, the toothpolish delivers a superior whitening effect, inspiring teeth up to four times whiter in three weeks. Not just a whitening toothpaste, it also delivers exceptional strengthening and cleansing properties. Essential fluoride and plaque removers encourage stronger and healthier teeth with everyday brushing; aiding enamel strengthening and whitening. Teeth are left feeling smooth, polished, stronger, whiter and healthier. Brush 2 times daily. Continue to use twice daily to protect whiteness. USE IN PLACE OF YOUR REGULAR TOOTHPASTE. Do not swallow. Not suitable for children under 7. Hydrogenated Starch Hydrolysate, Aqua, Hydrated Silica, Glycerin, Alumina, Sodium Dodecylbenzenesulfonate, PEG-12, Aroma, Perlite, Sodium Monofluorophosphate, Pentasodium Triphosphate, Alcohol, Pentapotassium Triphosphate, Cellulose Gum, Sodium Saccharin, Sodium Lauryl Sulfate, Pearl Powder, Limonene, CI 74160, CI 77891. Contains Sodium Monofluorophosphate (1300 ppm F).